Gorgeous villa with private swimming pool close to Florence (35 min by car or train) very large garden, accommodates up to 14 people. FREE WIRELESS INTERNET CONNECTION. Location is in a wonderful and undiscovered place, LONDA VILLAGE, shops and restaurants 5 minutes walk from the Villa, an excellent base from where to start visiting Florence, Siena, Pisa, Lucca and the main historical towns of Tuscany (San Gimignano, Cortona, Pienza, etc). By car within one hour you can easily reach Siena, Pisa, Arezzo, Lucca, San Gimignano. By train you can reach Rome,Venice, Cinque Terre within one hour and half. Villa Luciano is perfect for a family or a group vacation, for special events such as weddings, anniversaries, meetings, cooking classes. Accommodation is up to 14 people, offers infinite space and total privacy. It is exquisitely furnished with antiques and comfortable furnishings. The Villa is surrounded by acres of garden consisting of neatly clipped hedges, trees, flower-filled terracotta pots and a private swimming pool. Sandra is available during your stay at the reception office next to the Villa, she can help you with planning your stay and suggestions. She is knowledgeable about the area living in Chianti Rufina. Staff is available onsite for daily cook and maid services. To enjoy an authentic Tuscan experience, the Villa organises Special Tuscan Dinner, Cooking Class, Wine Tours/Tasting. 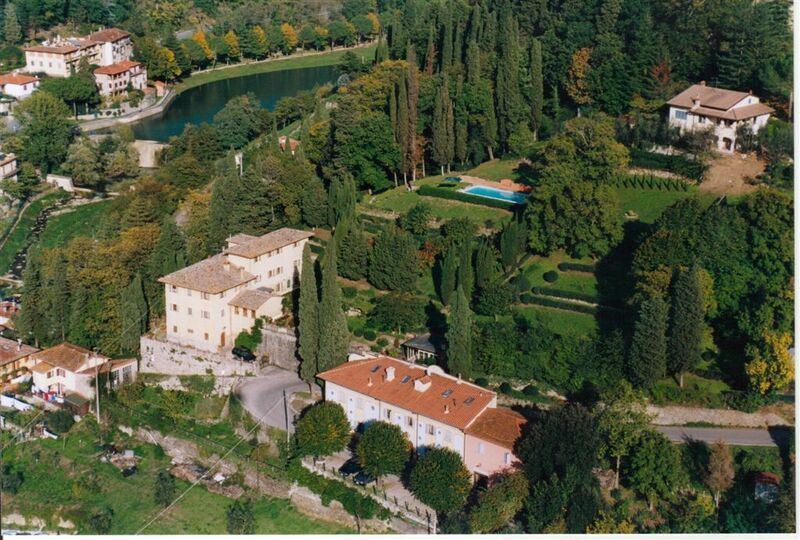 Come get your taste of La Dolce Vita at this breathtaking country mansion in Tuscany… the unforgettable Villa Luciano, owned by The Spagnoli Family for 200 years. Celebrating my 70th at Villa Luciano with my family was a dream come true. My group of 11 adults and 3 children, ages 3, 6 and 8 had so much fun exploring this beautiful, historical, vast property in the heart of Tuscany region in Italy. Londa town was a five minute walk down the hill, so we were able to do our grocery shopping for our daily breakfast and attended a Sunday mass at the nearby catholic church as well. We stayed at the villa last weekend of September to first week of October. Although it got a little chilly at night, there were plenty of warm, cozy blankets in each bedroom's closet, ready to use, which made us comfortable while we slept. Paolo, the host, was the real charm of all. He chauffeured us to/from all our destinations that made our stay easier and so much more enjoyable. Train ride from Contea - Londa station, five minute drive from the villa was an easy, fast alternative means of transportation.The panoramic views as we drove to the Tuscan countryside vineyards for our wine tasting events were breathtakingly gorgeous, just as exciting as the view from the villa. At the end of our day trips to neighboring towns, we did more fun activities at the villa: making pizza with Paolo, had cooking class with Gabriela who demonstrated to us her old style of cooking delicious authentic Tuscan dishes, and just relaxed, feeling home sweet home. On my actual birthday, the last night of our stay at the villa, my 3 kids collaborated with Paolo, Gabriela and Asis, Paolo's assistant who was graciously helpful and always knew what to do and to my surprise, a nice sit down dinner festively laid out in the formal dining room waiting for us. The whole experience was beyond our expectations and I cannot thank Paolo and his staff enough for making our family vacation the most memorable and most unforgettable one ever. We stayed in this property in July/August 2018 as two families both with 3 teenage children. Our first impression was to be completely overwhelmed at the vast size of this house. It is enormous! If you are a group of people do not worry there is enough space both inside the house and the gardens to "lose" yourself. The pool is lovely, set away from the house and the views are simply superb - a "typical" tucscan view into the valley. The town has a couple of bars and shops for your provisions. Nearby are plenty of restaurants and bigger towns with lovely restaurants and larger supermarkets. We had Gabrielle make us a Tuscan meal and it was delicious, personally I have four portions of the tiramsu! Its a must for a stay here. The only note of caution for those who are a bit infirm or with small children is there are a number of staircases to be negotiated. Altogether though a fabulous place we hope to return to one day. I am very pleased to have Nicola and her sister Kathryn staying at Villa Luciano with their husbands and beautiful children. They throughly enjoyed every moment from the first day of arrival relaxing inside the Villa and outside in the garden discovering the best restaurants of the area and Londa’s Coffe Bar with live music on Friday and Saturday eveing on the picturesque old square few steps down from the Villa. I really look forward to see them again back sometime in the future with a lot’s of memories left in Londa and at the Villa during this summer Tuscany holiday 2018. Lots of love to them. In July 2018 my family and I (14 people in total) had a week long break at Villa Luciano. Positioned on the hillside overlooking Londa village, the views from the villa are simply stunning. The vast gardens provided a picturesque environment for us to relax and unwind. At the top of the gardens there is an excellent swimming pool which everybody loved (especially the children!). The inside of the villa is beautiful and very spacious. Everything we required was provided (including an ice machine!). It was our host Paulo, however, that made the holiday extra special. He could not have been more informative, helpful and accommodating. He very kindly drove us to a fabulous restaurant on the outskirts of Londa that had been recommended to us. He also provided an extra nights accommodation (free of charge!) for 4 members of our family that had their flights cancelled the night before we were meant to leave. For that I am extremely grateful! We were hoping for a relaxing holiday surrounded by beautiful Tuscan scenery and this villa exceeded all our expectations. Thank you Paulo! We will return. It has been a great honour and pleasure to have this beautiful family coming from Lars in Scotland to choose Villa Luciano as base for their own Tuscany holiday. I remembered how lovely and affectionate were Amanda’s children enjoying very much the pool, the garden and the whole house feeling so at home. Amanda’s family will be always very welcome and I hope to see them again in Londa staying in our house sometime in the future. Kim and I just wanted to restate how much we enjoyed our stay at the fantastic Villa Luciano in Londa. Our party of 14 had an amazing time at the Villa and also the surrounding Tuscan area. The Villa is genuine and rustic, but beautifully laid out with all the amenities required for a large group to have a fantastic time celebrating multiple 50th and 25th birthdays. The pool area became a special area for our daily gatherings and certainly cooling in the heat of this particular summer. We also enjoyed our group dining at both breakfast and dinner on the raised area nearer the Villa. Having fresh growing Rosemary and Lemons to hand during BBQ evenings was wonderful. The local shops were very welcoming and stocked sufficient items to keep us all well fed and 'watered', we have a lot of Chianti converts now. I would recommend Villa Luciano for any group looking for a friendly, accommodating and authentic place to stay in or around Tuscany and within easy vehicle reach of the centers of Florence, Pisa & Sienna. Paulo along with support from Azizz made our stay memorable with great support, care and information. We along with the whole group would like to thank you for turning a very special event into an amazing 7 days in Tuscany. The Best Place to Stay in Italy! My family and I (13 of us in total) stayed here for two weeks this May and we couldn't have had a better time in Italy than at Paolo's family villa in the hills of Londa. Before even arriving in Italy, Paolo was attentive to our queries and willing to work with us to ensure that our arrival was smooth and easy. Once in Italy, despite landing in Rome instead of Florence due to delays, Paolo was similarly accommodating and helpful with my family members who arrived before me. I promise to tell you about the villa itself, but Paolo was the true star of our visit and deserves to be praised personally for all his wonderful hospitality and kindness. He even stayed with his aunt down in the town during our visit so that he could be nearby if needed and taught us to make pizza in the brick oven himself! The villa itself is a lovely piece of history that is comfortable and beautiful, homey and elegant, all at once. There are two wings off the main floor that allowed for everyone to stay comfortably and enjoy themselves on the grounds. The beds are comfortable, everything worked as expected, and all was delightful. It was also only a short walk to town where we were able to enjoy the local life, but even better was Londa's location in Tuscany, which allowed us to go far north and east to Lake Iseo and Bressanone for a weekend, all the way to San Marino and back in a day, and even do the Cinque Terre in single long day. There's a short train to Firenze, and there are some beautiful little small towns in the area (go to Poppi on Paolo's recommendation, it's a lovely little town!). This villa is certainly the nicest place I've ever stayed on vacation, Paolo was the most gracious and thoughtful host I've ever encountered, and I would highly recommend to anyone at all that they should stay here for their vacation! Our family of 13 had a great stay at the villa. It was perfect for a large family gathering with plenty of space for all. We all enjoyed the beautiful pool and grounds. We had the cook prepare our meal the first night and it was so good that we had her back again on our last night. The local restaurants were also very good and easy to get to by car or walking. The location was great for seeing sights all over Tuscany and part of our group even drove to Venice for the day. Having the train nearby to get to Florence also made that trip very easy. All in all it turned out to be more than we expected and a great vacation spot for the whole family. The only downside was getting enough hot water for showers at times.